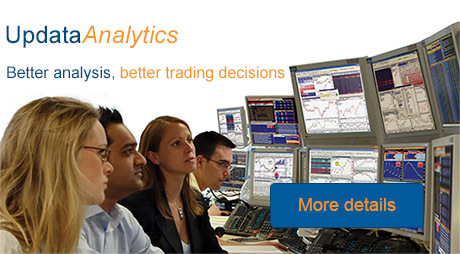 Updata's Technical Analysis is world class which is why so many market professionals run Updata Analytics on top of their professional terminals like Bloomberg and Thomson Reuters. Updata EnergyFeed gives energy professionals real-time exchange data, a unique source of real time OTC trades with history and scraped data from the internet. The feed also carries premium third party data services such as Argus, IIR energy and Nema. Updata's powerful back testing capabilities allow you to write systems in Visual Basic, C# and Updata Programming Language. Updata comes with libraries of over 1,000 pre-written custom indicators and trading strategies. 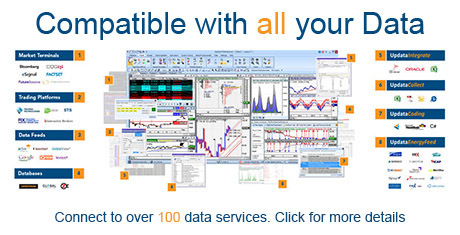 Updata Analytics is the best technical analysis software you will find with over 1,000 technical indicators. Our point and figure charts are second to none along with other techniques such as ichimoku charts and market breadth indicators. Updata adds an extra dimension to your Bloomberg charting or Thomson Reuters Eikon charts. The charting package is also compatible with a host of other data sources including: Barchart, CQG, Datagenic, DTN IQ Feed, Easyscreen, eSignal, FutureSource, Quandl and Trayport. Updata is also used for backtesting technical analysis, stock scanning technical criteria and producing technical analysis reports. We also provide technical analysis training courses and technical analysis research.